When you begin speaking a new language, there really is nothing better than the first time someone tells you that your accent is great, and you even sound like a native speaker. Of course, not everyone has the opportunity to move to a different country where they can get fully immersed in the language and master the dialects and accents. But that doesn’t mean you can’t improve your Arabic accent on your own. It just means you’re going to have to follow a few guidelines to really nail the pronunciation. Every language has certain elements in their sounds, rhythms, and tones that simply don’t match anything in the student’s native language. With Arabic, many English speakers struggle with some of the more guttural letter sounds (those sounds that come more from the back of the mouth). This impacts a person’s accent because we tend to turn those new sounds into something more familiar to us. In English, we have our “th” sounds and “r” sounds that can be difficult for speakers of other languages to master. And yet, these sounds are critical to getting the accent just right. Arabic is much the same. There are just some letters that will require more work to fully master. But when you do, that’s when people will start to notice your skills. Like we said above, you don’t have to move to a different country to accomplish this. But you do need to find new and inventive ways to surround yourself with opportunities to listen to a native speaker’s accent and to use it yourself. Immersing yourself can be accomplished through a range of activities and practices, but it really boils down to listening closely, testing your abilities, and then practicing it again. And again. And many times after that. The good news is that this kind of immersion is a lot easier than it used to be. You may be surprised how easy it is to surround yourself with Arabic TV shows, audio recordings, magazines, and newspapers. Through our program, you’ll even have direct access to professional native speakers. If you really wanted to, you could have the occasional “No English” days at your home, and only allow things in Arabic. It’s a bit of a challenge, but it can be a lot of fun. And it will be worth it when your accent starts to feel more natural. It all starts with listening closely and carefully. Then we’ll build on that foundation with the next steps. Listening is a skill, and it’s critical to learning a new language. As humans, we tend to hear what we want to hear and make associations with things we already know. When we hear some Arabic phonics we’re not familiar with, we’re all prone to find associations in English and hold onto that. Looking at it from the other side, it’s like when non-English speakers have trouble with the “th” sound and have to resort to “d” sounds or “z” sounds that are in their native language. Instead of relying on what you already know, work on listening to the new tones, rhythms, and inflections that the speaker is actually using. When you develop your ear for the correct pronunciations, you’ll be able to start using the accent like a pro. When there are sounds that are not a regular part of your native language, they’re going to be a bit of a hurdle. But like any other hurdle, when you jump it again and again, it will soon become a simple, smooth motion. One you hardly even think about. You’ll just take each one in stride. This is why we cannot overstate the importance of repetition. As you discover certain words and sounds that are harder to pronounce correctly, you can make a list of them and continue to focus on them until you can nail each one with perfect pronunciation. The same could be said for the alphabet. Find the letters that are the most different from what you are used to and repeat those sounds as often as possible. Soon, you’ll hardly have to think about it anymore. You’ll just take it all in stride. It’s really hard to improve your accent through book learning alone. You need to make sure that the words you’re using sound just like those a native speaker would use. As you develop your listening skills, you’ll begin to pick out all the little nuances in their pronunciation that you hadn’t noticed before. If you are working on a particular phrase or even some specific vocabulary, listen closely to what is said, and how they say it, and do your best to imitate it completely. If you’re imitating a recording or a TV show, repeat it over and over. With each viewing, mimic the words just as you heard them. You may want to record yourself while you’re doing this because sometimes the words we use sound different coming from a recording than they did in our head. This way, you can objectively compare how closely you’re saying the same line. Learning how to improve your accent is not a passive activity. We mentioned immersing yourself in the language, so let’s think of it like being immersed in water. Yes, you can sit in a pool and be fully immersed, but if you just keep sitting under all that water, eventually you’re going to run out of air. You need to be active to stay afloat. The same thing applies to learning a language. You could be passive, just listening and reading and letting the sounds and words pile up all around you. But if you get active about it, you can do so much more. In this case, that means actively conversing with a native speaker and constantly testing what you know to get immediate feedback on your accent. 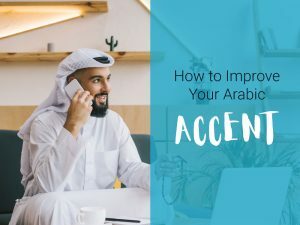 Of course, starting up a random conversation with someone in Arabic isn’t always an effective solution, but with Arab Academy, you will have the opportunity to regularly test your abilities with native speakers who are trained to help you develop your accent. Get enrolled today and start taking advantage of our 1-on-1 speaking classes and discover how these courses can help you start to master an Arabic accent.